Nancy Barnes Lays Out Her Initial Vision For NPR Newsroom : NPR Public Editor After listening and learning for four months, Barnes discusses her priorities and where the newsroom is headed. 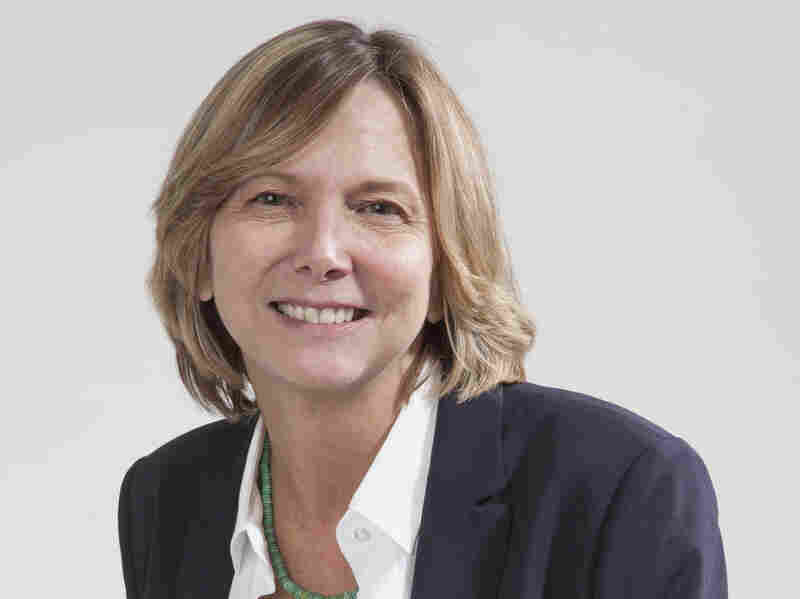 Nancy Barnes started as NPR's senior vice president of news and editorial director in late November, replacing the yearlong interim newsroom leader Christopher Turpin (who replaced the ousted Michael Oreskes). Barnes has been quiet about her priorities for NPR since, citing a desire to listen and learn during her first three months. That period is up, and Barnes, who came to NPR from the Houston Chronicle, last week sat down with me to talk about her initial impressions and where she's steering NPR. (For more on her background and the transition in NPR's newsroom, see NPR's earlier reporting.) In our wide-ranging conversation, she addressed the changing mix of stories on NPR's newsmagazines and newsroom diversity, and shared some initial thoughts about how NPR will cover the already-upon-us presidential election season. In what I'm certain will be seen by some NPR listeners as good news, Barnes said she is looking at what she called the "delicate balance" between live interviews and reported pieces and indicated she would like it to swing away from quite so many live interviews. "Even before I walked into the newsroom, I've been hearing the concern about this push for news [that] makes us sound or act more like CNN," she said. In a memo sent to the newsroom March 8, Barnes' first listed priority was to "develop more distinct, diverse and essential news stories and content as a part of NPR's core identity." Her memo added that the team assigned to this will examine "the tension between the need for breaking news vs. enterprise" (reporting that is original and not based on press releases or news of the day). I've written about that tension at NPR's daily newsmagazines several times (including here and here), and in many ways it is at the core of a good number of the concerns we hear from listeners who reach out to the Public Editor's office. Some background: For the last four years, NPR has been moving steadily to a daily format that emphasizes one of radio's strengths: its ability to reach people with news that is immediately up-to-date. Some of that change is a need to hear directly from newsmakers and some has been out of sheer necessity: Live interviews, with newsmakers and NPR's own reporters (or those from member stations), are sometimes the quickest, if not always the best, way to stay on top of the daily barrage of major stories. It takes more time for reporters to put together a report that weaves together multiple interviews and sound. But listeners and many in the newsroom have raised concerns that the balance is off. Moreover, live interviews bring journalistic challenges. Reported pieces can work in a broader range of information and views than can an interview, and they can be fact-checked in advance. Hosts doing live interviews must be very careful to catch if a guest shares false information. They also are at times put in the position of sounding like the "opposition" — if they are interviewing a Republican, then they often push back with Democratic arguments, and vice versa. Listeners often hear this questioning (which is meant to tease out multiple perspectives) as bias on the part of the host, particularly because NPR does not generally run reports from opposite points of view back-to-back. Barnes told me: "Sometimes you have no choice, right? So a story is breaking and you want to be immediate and relevant." She said she believes "we do need to be timely and relevant and newsy, particularly if we are a primary source of information. But what we want to dial back on is incremental news, and I think the push to be newsy sometimes does lead you down that path of too much — I call it 'turn of the screw' journalism. I don't want to say we do a lot of that. I'm just trying to dial back on incremental updates so that we have more time and eventually more resources for exclusive journalism. Stories that only NPR can provide, that's really what I'm looking for." That reporting might take several forms, she said, including more investigative reporting. She said she has also asked some newsroom editors to propose 10 to 12 coverage areas that NPR "could really own, so that we could realign resources behind that." That list is still in the works (and will likely include some of the areas where NPR already shines). Exclusive interviews will also be part of that mix. She highlighted Morning Edition's recently begun "Opening Arguments" with some of the Democratic presidential candidates. In the reported realm, she cited recent series on anger and civility and the yearlong arts and music series on American anthems. Back to the tenor of the live interviews: The Public Editor's office hears listener concerns when interviews get testy; we also hear the opposite complaint that some interviews aren't testy enough and that hosts have allowed false or questionable statements to go unchallenged. Barnes said the topic is "more complicated than anybody imagines. I won't talk about this particular guest, but somebody raised questions about why we didn't push back on guest x, and in this case it was a very strong effort to bring in a Republican point of view on a story. And I think it's a catch-22. You invited this person in to tell his side of the story, and if you push back hard on what he's saying, then you give the impression that you're not fairly listening to an alternative point of view." Also, sometimes guests come on with talking points and "arguing with them isn't gonna do anybody any good." Conversely, she said she does not want to "ever tell a journalist not to push back if they think somebody is not being straightforward and honest," but added, "We have to make sure that it doesn't sound like partisan pushback." "By and large," she said, "we do a much better job than many media organizations of not being partisan." When news breaks, the newsmagazines "bend over backwards" to talk to a wide range of guests and, "it's usually very civil conversation," she said. Some of the audience reaction may reflect the fact that, "We are in the most complicated, divisive times that we've seen in a generation and it's hard to bring these issues on and talk about them in a way that doesn't have somebody out there who disagrees, right?" She added, "I have nothing but the utmost respect for the hosts who have to tackle an extraordinarily wide range of stories with depth and precision and bring humanity to the conversations. What they do on a day-to-day basis is really just, you know, a phenomenal range of journalism and it's very challenging," given the range of topics on which they need to be knowledgeable. The topic of diversity came up several times in our conversation. Barnes said she is committed to diversifying the newsroom at all levels, from entry level up to the top leadership (where NPR falls short, in some respects). She said she is not ready to discuss the specific steps that are under discussion, but did say, "It's not just about diverse hiring, but it's also about making sure that we are reflecting diverse people and diverse stories" in the coverage. (She cited NPR's analysis after Trump's Oval Office speech on the border wall, when, as a staff member pointed out, there were no nonwhite voices.) In particular, she said, "We are really committed to making sure that we have Latino representation in our 2020 election coverage," which was largely absent in 2016. "So, diversity of sources, diversity of hiring, diversity of storylines," and also, diversity of thought, she said. Politically, "most newsrooms tend to lean a certain way," she said, referring to studies that show journalists tend to be more liberal, adding, "We have to work really hard to counter those instincts." She has seen comments from a few NPR journalists along the lines of, "We're conservatives and we don't feel comfortable speaking our minds in the newsroom," so NPR needs to "be mindful of diversity of thought," she said. Geographic diversity is also on her mind, she said, citing, as just one example of a story that needs covering: "Why is there so much misery in the middle of the rural heartland?" That need to get outside the East Coast (and California) bubble is of course a criticism that was leveled at national media outlets, including NPR, during the run-up to the 2016 election. And it continues to be of concern to NPR listeners, who are nationwide. Getting outside that bubble should not "be an exercise just during the elections," Barnes said. If national news organizations had been covering broad swaths of the country and regional communities prior to the 2016 election — if "you're willing to go talk to people who are different than you and make a point of it" — they might have picked up on some of the trends and tensions sooner than they did or minimized them less, she said. Barnes said she likes the idea of NPR having a dedicated rural beat, as it did years ago, but whether that happens specifically or not, "we need to find ways to get outside the Beltway more often." She said she has been talking about shifting some resources to the West Coast, "but that also is an elite coast." NPR's network of stations across the country could also help contribute a broader perspective. However the resources get deployed, she said, "I will say I think sometimes we focus on Washington too much. If you get outside Washington," she said, "you realize that not everybody is talking about Trump and Mueller every second of the day. They're really not. But if you're in Washington, that's all anybody's talking about. An editor said to me, 'Well I realize we talk a lot about Washington, but it is the story that's driving the country and the world.' And there's something to that, as well. But we do need a little more balance in our report, so that it doesn't feel like we're topping every hour with three stories out of Washington." As Barnes indicated, NPR's election coverage has already begun, with the coverage of the Democratic candidate announcements that keep coming. Who will lead that coverage is up in the air. Beth Donovan, NPR's senior Washington editor, who began running the election coverage in 2000 and has overseen all political and Washington coverage since 2014, two months ago said she would step down in May. NPR is just beginning an internal and external search to replace her. Barnes has set a tentative deadline of June to find Donovan's replacement, but she said she couldn't guarantee that timeline. Of the ongoing Washington coverage, she said that, without criticizing the team — "which is really stretched and working hard" — she would like to be able to break more Washington news by giving them more time to do original reporting, and perhaps adding investigative reporters to that beat. She told me, "I don't think we win, frankly, in trying to beat The New York Times on the Russian investigation," but there are many other Washington coverage areas wide open. "As I've been telling people, it's a lot easier to cover the same stories that anybody else is covering. It's actually harder to go find the stories that nobody else is covering." She said she is hoping to find the resources for that work. As for election coverage, the age-old debate is "horse race politics" — who's up, who's down in polls and fundraising — versus spending time on voter concerns and the candidates' policy proposals. Barnes said, "the conundrum here for journalists is, everybody hates horse race politics and yet it actually drives a lot of audience." During the last presidential election, she said, "I was really appalled at how much people were treating polls as pure science. You know, polls are a good indicator, but all sorts of things — people can lie to pollsters, pollsters can put screens on how they predict turnout. So we need to pay attention to the horse race because you don't want to be irrelevant, spending your time covering a candidate who's never gonna get traction. But that has to be a component of the coverage." My office is already hearing complaints about how NPR is parceling out its political coverage among the many Democratic candidates; media attention is, of course, one way that a candidate can gain traction (but certainly not the only one). We will come back to that issue as NPR's political plans take shape. The price of pharmaceuticals is one of the voter concerns that Barnes said she could see NPR focusing on. "Identity politics" will be an issue in the campaign, as well, she said, and election security will be a focus. On that issue, she said, "I think none of us were truly aware of exactly how much social media was compromised in 2016," and new issues such as news sites that aren't really news sites continue to pop up. "We just have to be really on our game," she said, with regards to these issues. I'll give the last word to Barnes. "We talk about things that are on my agenda, but you know I want to say: It's a great newsroom," she said, adding, "you might quibble with the strategy or we might quibble with some of the storylines, but people here are really, really dedicated to serving the NPR audience and broader journalism." She called it "a thrill to work with them." If you'd like to share your thoughts or have a question, you can reach us here or on the Public Editor Facebook page.